When many people think of Venison, they think of deer meat; but the truth is the title "venison" is given to almost all "wild game on four legs". 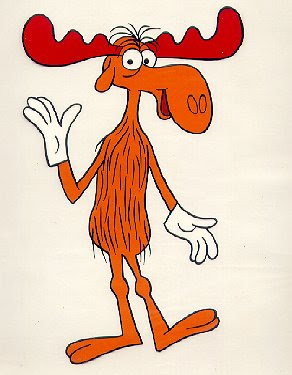 Venison can be caribou, or elk, or even moose, but is most commonly deer. Adorable, sweet, never-hurt-a-fly-unless-you-count-eating-the-flowers-out-of-your-yard deer. Now I know you're waiting for me to mention her name--and I did consider railing on her--but let's be honest. If there's one thing Sarah Palin's new TV show showed us, it's that she's a phony, not a "real" hunter. She's showing the needless torture and slaughter of animals as a fun way to bond with your kids and spend a weekend. I myself don't think that raising children who are indifferent to the suffering of others and lack any sense of mercy or compassion is good parenting. I mean, does the world need more sociopaths? 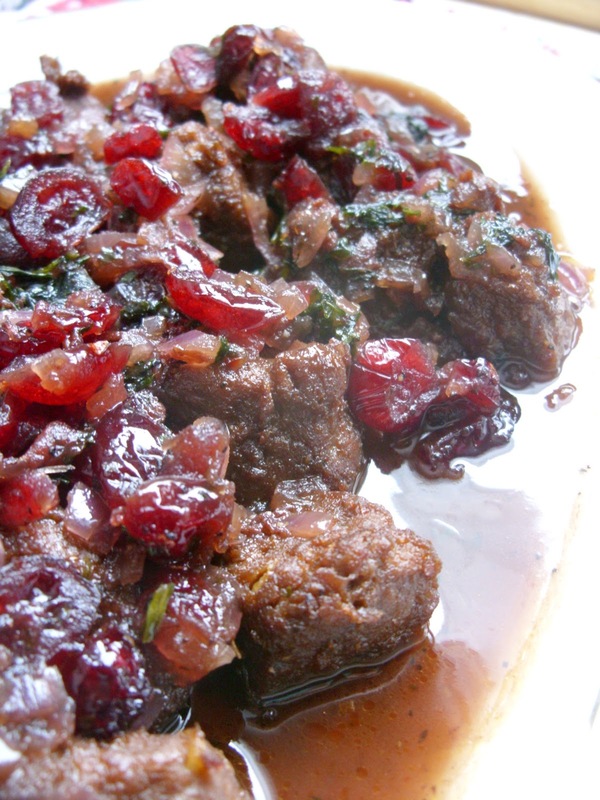 I also think that this recipe proves that you can make a proper, old-school, American Christmas classic like Venison with Cranberry Sauce without ever loading a gun, and that real Mama Bears go berry picking in the woods and leave the other critters be. Those are the family values I'd want to raise my kids with. In a small bowl mix Dijon Mustard and 1/2 Cup Red Wine with a whisk until blended. Place Gardein in a shallow glass bowl and pour Wine Mustard Marinade over the top. Cover dish and place in the fridge for 1 hour. During that time go in and mix the Gardien a few times so it gets an even coating and the Marinade doesn't separate too much. If you don't like spicy food, you may want to not let it sit for the full hour. Remove the Gardein and place on a plate and sprinkle with Black Pepper. Keep your Wine Mustard Marinade. In your kindred little skillet, heat Olive Oil over a medium to high heat. Then brown the Gardein the skillet till it gets nice crisp edges. It will take around 5 minutes. Then remove Gardein and place it back on the plate you had used to add the Pepper. Don't dump the Oil from your skillet. Add the remaining 1/2 Cup of Red Wine, Braggs, Basil, Red Onion and Parsley. Cook until Red Onion is tender. Then mix in Apple Jelly and Margarine. Once the Jelly melts remove the pan from heat and stir in Cranberries and Gardein. When you're adding the Gardein try to get the drippings from the plate into the sauce. Stir it all together. When serving, place the Gardein on the plate first and then ladle the Cranberry Wine Sauce over the top. I just tried the Gardein Beefless Tips recently - they are delicious! I love the savory/sweet combo, will definitely try this recipe! i stumbled my way onto your blog today - and LOVE it. 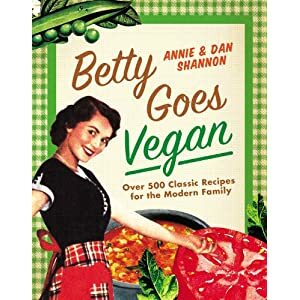 I am a vegetarian, not a vegan, but as a recent vegetarian convert, I have found my trusty Betty Crocker cookbook to be a dust collector. I can't want to try some of your version of my old favorites! My New Year's Eve dinner! Fabulous!